A recent survey of 350 CFOs taken by Bill.com found that when CFOs automate their accounts-payable process in the cloud, the AP department cuts its work time by more than half, and slashes the cost per invoice by up to 70%. 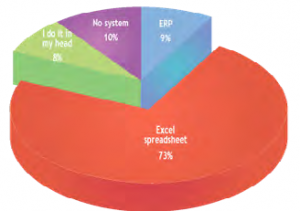 But surprisingly 73% of the respondents said they still use Excel spreadsheets to record and process invoices. So what’s stopping CFOs from getting their head into the cloud? When asked to name their biggest challenges in moving to a cloud environ-ment, 64% of survey respon-dents said integration with existing legacy systems, 55% cited system and network security, and 44% noted the trouble and work of introducing new processes. “Transiting AP and AR to the cloud using a solution like Bill.com significantly reduces the historically manual involvement of getting invoices out and payments back in. We call it friction-less AR,” says Lynnea Bylund of Catalyst House. 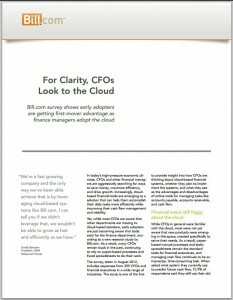 ‘But the familiarity finance departments have with whatever system they’re already using, and the minimal costs associated with continuing to use it, have been leading many finance departments to close their eyes to the benefits they know they can get from the cloud,” reports Taylor Provost at CFO.com. 16.5% of financial executives said that, as far as they know, cash flow management tools and systems are nonexistent in the market; 22% said they know the tools exist but their company doesn’t use them. When asked what they think are the biggest challenges in moving to a cloud environment, 64.1% of survey respondents said integration with existing systems, 54.7% said system and network security, and 43.6% said introducing a new process. Financial executives are discovering that by putting their AP process in the cloud, they can cut their work by more than half and slash the cost by 50% to 70%, a saving that amounts to tens of thousands of dollars for many organizations. Another incentive for moving to the cloud is the chance to reduce the flow of paper bills and transition to a paperless work environment. The vast majority of survey respondents (85.5%) said reducing paper was either very important or somewhat important to them. Only 14.5% said it was not important at all. According to the survey, these results show cloud-based tools, especially those for cash flow management, are still emergent in the marketplace. For early adopting CFOs, deploying tools that are on the brink of changing the financial industry will give them a competitive advantage as they leapfrog past other companies, due to their increased efficiency, effectiveness, and cost-savings. Bill.com gives you command and control over your cash flow, payables, and receivables – anywhere, anytime. It rakes in receivables faster, shows you the best time to pay every bill and eliminates hours of paperwork and drudgery. It invoices your customers, pays the bills on your schedule, banks your deposits and even syncs everything with your accounting program, freeing your time – and your mind – to grow your business.